Chicken was the theme for this Taste of Home Cooking Recipe Swap. I make chicken at least once a week, and am always looking for and trying new ways to prepare it. I currently have over 100 chicken recipes in my blog and love that I'm nowhere near close to running out of new recipes to try. Chicken is so versatile and works with almost every ingredient, flavor, and cuisine imaginable. 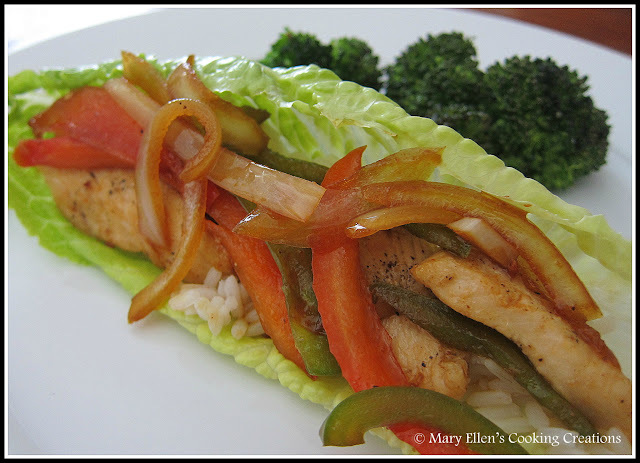 I submitted my Lemon Romano Chicken and was given a recipe for Chicken Stir Fry Lettuce Wraps from the blog Hezzi-D's Books and Cooks. I have made chicken lettuce wraps before using a copy-cat P.F. Changs recipe that called for ground chicken. This recipe, however, used strips of chicken breasts, giving it more of a fajita feel. Actually, I think this recipe would work well seasoned with Mexican flavors too - some chilis, lime, and cilantro! This was a really easy recipe, making it perfect for a weeknight. The sauce was very simple, but flavorful. The original recipe called for jasmine rice but I used plain white rice since that's what I had on hand. I planned on making just one other change - I cut up some green onions to put on top of the wrap, but when it came time to eat we both forgot about them! Since I'm always looking for ways to make weeknights easier, re-purpose leftovers, and cut down on prep time, I thought about how that could be done with this recipe (unfortunately, or fortunately, we liked it so much that we didn't have any leftovers!). Anyway, you could make this dish using leftover chicken, and just make the sauce when you are ready to eat. Alternatively, make extra of everything, and fry your rice the next day giving you a new dish using your leftovers. Or just make extra chicken and toss it with some romaine, crunchy noodles, matchstick carrots, green onions, and this sesame dressing for a great lunch. Thanks for sharing this recipe, Heather Lynne! Heat 1 tbsp of the olive oil in a large saute pan over medium high heat. Add the chicken and cook, stirring constantly, for 4-5 minutes or until cooked through. Transfer to a plate and keep warm. Wipe out the pan and add the remaining olive oil. Add the peppers and onion; saute for 3 minutes. Reduce heat to medium and add the garlic, ginger, and red pepper flakes; saute 1 minute. Add the soy sauce, rice vinegar, and Sriracha; cook for 2-3 minutes. Return the chicken and accumulated juices to the pan. Toss to coat. Let simmer 2 minutes to warm up the chicken. To serve, put some rice in the center of a Romaine heart. Add some chicken, veggies, and sauce. 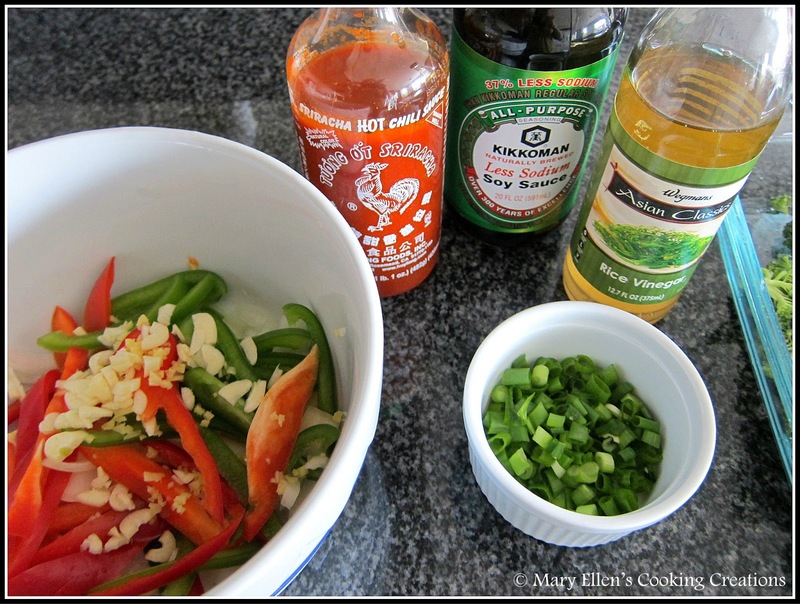 I love these flavors together- sriracha, red pepper flakes, soy sauce. I am in! I like the idea of the thin chicken strips too, this looks great! Mmm...spicy chicken lettuce wraps!! Sounds great!! I'm so glad you liked them! They are a staple on our menu because of how easy they are to prepare. Mmmm...looks awesome. I love the chicken strips vs. ground chicken, like a fajita in lettuce. Yum! Spinach Pie - Let's Do Brunch!